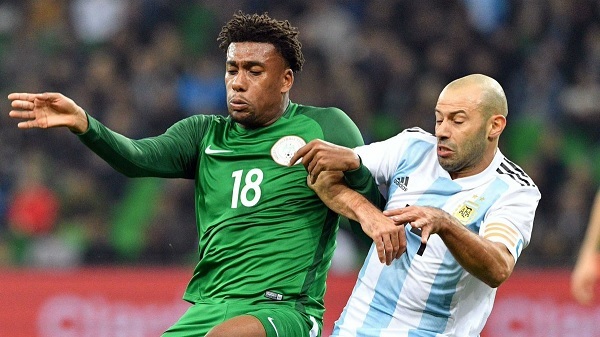 Super Eagles forward, Alex Iwobi has revealed that the players are confident of beating Argentina at the 2018 World Cup regardless of their star-studded team. Both teams met in an international friendly game last year, where Nigeria defeated Argentina 4-2 despite going two goals down at halftime. Iwobi, who was part of the scorers during the friendly encounter, told BBC Sports that the Super Eagles replicate their superlative performance by edging Argentina in the group. “Argentina were missing their star man [Lionel] Messi, but we were also missing some of our players. We are confident we can repeat that at the World Cup,” Iwobi told the BBC on Tuesday.